HAL® Therapy is the medical service with Robot Suit HAL® to provide medical treatments for functional improvement of patients with cerebral, nervous and muscle disorders including spinal cord injury and cerebral embolism. When a person intends to move his or her body, nerve signals are transmitted from the brain to muscles via motor neurons and then, a musculoskeletal system such as a joint moves. At that time, subtle “bio-electric signals [BES]” leaks out onto the human skin, which reflects his or her intention to “move”. HAL® that reads BES and controls a power unit is able to assist the joint’s movement in harmony with the person. There is a hypothesis: When a patient use Robot Suit HAL® that provides motion assistance in line with BES as a reflection of motion intention, by the intermediation of HAL®, interactive Bio-Feedback [hereinafter “iBF”] is prompted among HAL®, the cerebral/nervous system and the muscular system via or outside the human body. BY “iBF”, functions of patients with cerebral/nervous system and the muscular system disorders, which had increased due to aging society, would hypothetically be reduced. Based on this “iBF” hypothesis, via clinical application, possibility of functional improvement in human walking is getting confirmed. In other words, not only the motion caused by the transmission of spontaneous command signal “I want to move!” from the human brain to the musculoskeletal system via the spinal cord and peripheral nerves, but also feedback of the actual feeling “I could move!” to the brain are the important keys to accelerate functional improvements. Treatments for functional improvements and functional regeneration are kinds of new robot therapies, which aim at improvement of motor functions using HAL® based upon the above-mentioned “iBF” hypothesis. CYBERDYNE Inc. and it’s business partner, Berufsgenossenschaft Rohstoffe und chemissche Industrie [Professional Association of Raw Materials and Chemical Industry, hereinafter BG RCI] in Germany, jointly established Cyberdyne Care Robotics GmbH in Bochum, Nordrhein-Westfalen [hereinafter “NRW”], Germany, which aimed at treatment for functional improvement of patients with cerebral, nervous and muscular system disorders including spinal injury and cerebral embolism. This is the great step of the Japanese most-advanced robotic remedial device in the world and treatment for functional improvement utilizing Robot Suit HAL® toward the internationally recognized medical technology and therapeutic measure. Robot Suit HAL® that is developed, manufactured and marketed by CYBERDYNE Inc. was accredited Certification of conformity to Medical Device Directive [hereinafter MDD] of EC for the first time in the world as a robotic remedial device* by the EC’s largest notified body. This enables CYBERDYNE Inc. to indicate CE Marking for Medical Device, which requires periodic examination, on Robot Suit HAL®, for distributing and marketing it as a medical device in the whole EU region. *Announcement was made in Japan and Germany on August 5th, 2013. In view of various insurance applications in the whole EU region, dissemination of treatment with HAL® is expected. It is notable that Deutsche Gesetzliche Unfallversicherung [German Statutory Accident Insurance, hereinafter “DGUV”] decided to apply workman’s accident compensation insurance to the treatment for functional improvement utilizing Robot Suit HAL®, which is managed by the joint venture company. The fee* for medical treatment with HAL®, of which one time fee is €500 and number of times is up to 60 plus additional treatment, is fully covered by the compensation insurance. CYBERDYNE Inc. and the joint venture in cooperation with New Energy and Industrial Technology Development Organization [hereinafter “NEDO”] of Japan, the state of NRW, BG Bergmannsheil Hospital, Germany, University of Tsukuba, Japan, in order to contribute to the society widely, pursue various possibilities of HAL® and promote practical materialization of it in the society, are going to proceed verification tests of HAL®. Philippe von Gliszynski fell 3m from a roof when he was removing snow. His body below the 12th thoracic spine got paralyzed. Though he had a little sensation in his left leg, after one time surgery and regular rehabilitation, he should prepare himself for a wheelchair-bound life. He participated the clinical test for functional improvement with HAL® in February, 2012. At that time, it took 72 seconds for him to walk 10m with a walker but, in June, his symptom was so improved that it took only 26 seconds. 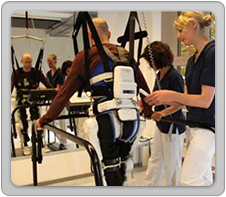 After training he became able to walk more than 1,000m with a walker without being assisted by HAL®. Nobody could imagine that at the start of treatment with HAL®. In 2013, Cyberdyne Care Robotics GmbH is providing the treatment with HAL®. With regard to details, refer to information of each center.